A recently published report from the Community College Research Center and social policy researcher MDRC examined alternatives to traditional placement testing for math and English in deciding whether a new student should be placed in developmental courses rather than right into college courses. According to "Toward Better College Course Placement," about 60 percent of community college students are directed into at least one remedial education course based on their results from placement tests such as the College Board's ACCUPLACER. Roughly a third of them are probably "misdirected." A team of researchers from both organizations used the experiences of 10 Minnesota and Wisconsin colleges to come up with a "multiple measures assessment (MMA) system," which combines results from traditional tests along with other measures to make the decision. For example, strong evidence suggests that high school grade point average is a solid predictor of college success. After all, the researchers wrote, GPA tracks performance over multiple years and reflects not just content knowledge but behaviors, "such as attendance and participation," that influence college success. The goal of the project and the report is to help overcome resistance among college leaders who "may be hesitant to change the way placement operates, skeptical about the measures used or unsure where to start." The guide offers examples and lessons learned from the first phase of the project, to come up with advice for approaching "each step of the process." 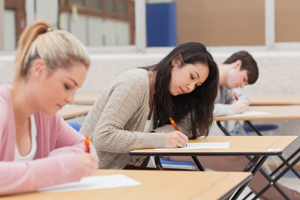 In a pilot program run in summer 2017, students who appeared to need remedial education based on their test scores could also be "bumped up to a college-level course" based on GPA and other "noncognitive assessments," such as ACT Engage or the Learning and Study Strategies Inventory, which can gauge such qualities as motivation and problem-solving. The guide is thick with recommendations for how to approach changes to current practices. The process needs to start with "taking stock" of institutional readiness and reviewing state and college policies related to placement practices. For instance, if faculty and college leadership doesn't support the use of new assessment processes, the implementation is bound to be bumpy, the report suggested. Additional guidance touches on how to organize the work, choose the placement criteria, manage the logistics of the MMA system, make sure it works as intended and estimate the costs of MMA design and planning. "Because developmental education requires student time and expense, it may discourage some potential college students. It is important to ensure that those who could succeed in college-level courses get the opportunity to take them upon entry into college," the report concluded. "The use of an MMA placement strategy should increase the chances that students will be optimally placed, which should then increase their chances of future success." The next phase of the project will use a randomized controlled trial of multiple measures assessment in five of the pilot colleges. In addition, MDRC and CCRC researchers are also currently evaluating multiple measures for placement at seven colleges in the State University of New York (SUNY) system. Funding for the project was provided by Great Lakes Higher Education Corp. & Affiliates, an affiliated group of companies that focuses on college access, college completion and student loan repayment. The report is openly available on the CCRC website.